LifePak 500 medical replacement battery is rated at 12V, 7.5Ah, 90 Whr. 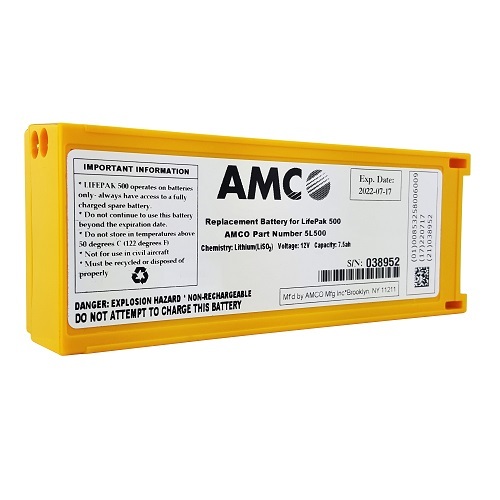 This replacement battery for Physio-Control LifePak 500 is 100% compatible and will meet or exceeds original specification. Non-Rechargeable Replacement battery for the Physio-Control LifePak 500 Defibrillator . Replaces 3005380-026, 11141-000013, 3208231-000, 11141-000147 and 3200390. • Self Testing: The non-rechargeable lithium battery pack requires less maintenance then the rechargeable SLA battery pack since it never requires charging. With the lithium battery pack installed, the LIfepak 500 battery automatically tests it as part of the Daily Auto test. The AED also performs the battery test the first time the AED is turned on after a new battery has been installed. • Proper Maintenance: Do not attempt to recharge. Do not use beyond the expiration date marked on the label. Do not expose to temperatures greater than 50 degrees Celsius (122 F). Do not allow electrical connection between the contacts, as it can blow the internal fuse and disable the battery permanently.